The term evolution in general refers to the process of change. For example, one can describe the way in which a section of land evolves over time. Geologic evolution comes about as the result of forces such as earthquakes, volcanoes, land movements, rain, snow, wind, and other factors. In biology, the term evolution refers to changes that take place in organisms over long periods of time. For example, one can study the changes that take place in a population of fruit flies over many generations. The characteristics of that population after 100 generations is likely to be quite different from the characteristics of the first generation of flies. Scientists and laypeople often refer to the theory of evolution. The term "theory" in this phrase does not refer to a scientific guess, as the term is sometimes used. Instead, the term refers in this case to a large collection of well-established laws and facts about the ways organisms change over time. The theory of evolution is not in any sense an idea whose truth needs to be tested. Instead, it is one of the most fundamental and most important general concepts in all of the biological sciences. 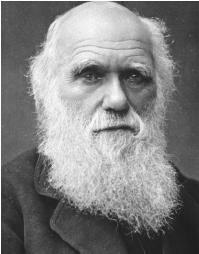 The English naturalist Charles Darwin (1809–1882) is generally regarded as the father of modern evolutionary theory. However, evolutionary thought can be traced to much earlier periods. In the mid-eighteenth century, for example, the French mathematician Pierre-Louis Maupertuis (1698–1759; last name pronounced moe-per-TWEE) and the French encyclopedist Denis Diderot (1713–1784; name pronounced da-NEE deeduh-ROE) proposed evolutionary theories that contained ideas that reappeared in Darwin's own theory a century later. and abandoned, Lamarck remains the first scientist to acknowledge the adaptability of organisms. Darwin and his contemporary, Alfred Russell Wallace (1823–1913), are credited with independently providing the first logical theory for a mechanism to explain evolutionary change. Darwin and Wallace called that theory natural selection. However, Wallace did not develop his ideas as fully as did Darwin. As a result, it is Darwin who is generally given credit for having founded the modern theory of evolution. He outlined the fundamental ideas of that theory in his 1859 book The Origin of Species by Means of Natural Selection and his later works. One major difference between the two men was that Wallace did not believe that natural selection could have produced the human brain. He thought that human intellect could only have been created by a higher power (a god), a concept that Darwin rejected. DNA (deoxyribonucleic acid): A large, complex chemical compound that makes up the core of a chromosome and whose segments consist of genes. Fitness: The ability of an organism to survive in an environment as measured by the average number of offspring produced by individuals with a certain set of genes, relative to that of individuals with a different set of genes. Mutation: A change in the physical structure of an organism's DNA (deoxyribonucleic acid), resulting in a genetic change that can be inherited. Natural selection: Also referred to as "survival of the fittest," the process by which some organisms are better able to survive and reproduce in some present environment. In The Origin of Species, Darwin concluded that some individuals in a species are better equipped to find food, survive disease, and escape predators than others. He reasoned that these individuals are more likely to survive, mate, and produce offspring. Individuals that are not as well-adapted to their environment are less likely to survive, mate, and produce offspring. As a result, each generation of a population will consist of individuals that are better and better adapted to their environment. The overall characteristics of the population will change to reflect this better adaptation. The major problem with Darwin's theory—which he acknowledged—was that he didn't know the mechanism by which successful adaptations could be passed from one generation to the next. The solution to that problem lay in the research done by the Austrian monk and botanist Gregor Mendel (1822–1884). Mendel discovered that hereditary characteristics are transmitted from generation to generation in discrete units that he called "factors" and that we now call genes. Darwin's theory can be restated to say that individuals who are better adapted to their environment are more likely to pass their genes to the next generation than are other members of a population. Support for the theory of evolution comes from a number of sources. One of these sources is the science of embryology, the study of early forms of an organism. Darwin reasoned that organisms that have passed through a period of evolution will retain some reminders of that history within their bodies. As its turns out, virtually all living creatures possess vestigial features. A vestigial feature is a structure that once served some function in an ancestor and remains in an organism at some stage of its development. But the structure no longer serves any function in that organism. As an example, the embryos of all vertebrates (animals with backbones) look remarkably alike at an early stage. They all contain, for example, a tail-like structure that may or may not be lost as the individual develops. Also, fetal whales, still in their mothers' wombs, produce teeth like all vertebrates. However, those teeth are later reabsorbed in preparation for a life of filtering plankton from their ocean habitat. Snakes, whose vertebrate ancestors ceased walking on four legs millions of years ago, still possess vestigial hind limbs with reduced hip and thigh bones. In some cases, the same structures may be adapted for new uses. The cat's paw, the dolphin's flipper, the bat's wing, and a human hand all have a similar structure. They all contain counterparts of the same five bones forming the digits or fingers (in humans). There is no known environmental or functional reason why there should be five digits. In theory, there could just as easily be four or seven. The point is that the ancestor to all tetrapods (vertebrates with four legs) had five digits. Thus, all living tetrapods have that number, although in a modified form. Another important source of evidence about evolution comes from the fossil record. In general, one would expect, if evolutionary theory is correct, that the older a fossil is the simpler and more primitive it is. Such, in fact, is the case. Fossil invertebrates (animals that lack backbones), plants, and animals appear in the rocky layers of Earth's crust in the same order that their anatomical complexity suggests they should: with the more primitive organisms in the older layers, beneath the increasingly complex organisms in the more recent deposits. No one has ever found a flowering plant or a mammal in deposits from 400 million years ago, for instance, because those organisms did not appear on Earth until much later. In some cases, evolution can actually be observed. Organisms that reproduce rapidly can be exposed to environmental factors that would affect the make-up of the population. In one famous experiment, Joshua Lederberg (1925–) and Esther Lederberg (1922–) exposed bacterial colonies to an antibiotic. In the first stages of the experiment, most bacteria in the colony were killed off by the antibiotic; only a very few survived. As the colony reproduced, however, that pattern began to change. More and more individuals in the population were resistant to the antibiotic. Eventually, the antibiotic was no longer successful in killing off the new strain of bacteria that had evolved. Finally, evidence for evolution can be found in the most fundamental part of living organisms: the structure of their DNA molecules. DNA (deoxyribonucleic acid) is the molecule in all living cells that controls the functions of those cells. When one studies the DNA of animals that appear to be related to each other on a superficial level, such as humans and chimpanzees, very close similarities in the DNA of these animals can also be observed. One of the fundamental questions in evolutionary thought is how changes take place within a species. How does it happen that the organisms that make up a population today are different in important ways from the organisms that made up a similar population a thousand or a million years ago? For biologists, that question can be rephrased in terms of changes in gene frequencies. Suppose one could make a list of all the genes in a population of muskrats in a particular geographical region. Since all the individuals in that population are muskrats, they will share a great many genes in common with each other. However, all muskrats in the population will not have identical genes. There will be some variability among those genes. Natural selection. An important factor in the evolution of a species is that, as a whole, a species tends to overproduce. That is, under most circumstances, more muskrats (or any other organism) are born each year than can possibly survive. Environmental factors such as food, water, and living space limit the number of individuals that will survive in any one year. So, how did it all begin? Any discussion of evolution eventually leads to the most basic question of all: how did life begin on Earth? Humans have wondered about that question for centuries. One of the oldest beliefs is that organisms are created by the process of spontaneous generation. According to this theory, organisms arise out of nonliving matter almost magically—from garbage, refuse, muddy water, and other places where dirt collects. In the 1860s, French chemist Louis Pasteur (1822–1895) showed that living organisms only come from other living organisms. So the question remained, where did the first organisms come from? The most popular theory today is that the first living organisms probably grew out of the warm "chemical soup" that existed on Earth's surface three to four billion years ago. That soup consisted of compounds of nitrogen, oxygen, carbon, and hydrogen. With energy provided by sunlight, lightning, and the heat of volcanoes, those compounds apparently came together to form amino acids. Those amino acids, in turn, reacted with each other to form proteins, the building blocks of all forms of life. In 1953, American chemist Stanley Miller (1930–) showed in a laboratory experiment how such reactions might take place. Since that time, more and more experiments have strengthened the "chemical soup" theory of the origin of life. Still, other theories remain. For example, some scientists believe that the seeds from which life on Earth began arrived on our planet millions of years ago from outer space, brought by meteors that fell to the planet's surface. Recent discoveries by astronomers of the presence of these "life-giving" chemicals (complex carbon molecules and water) in comets, in the dust and gas of distant stars, and in the emptiness of outer space lend some support to this theory. For all living organisms, then, life can be seen as a struggle. A constant battle goes on among the individuals to determine which individuals survive and which will die. In determining the outcome of that battle, it should be obvious that those individuals best adapted to an environment will survive. For example, in a cold environment, individuals that are somewhat better able to live in cold temperatures are more likely to live than those that are adapted to a somewhat warmer environment. More to the point, individuals that are adapted to an environment are more likely to live and to reproduce. Those individuals are more likely to survive, reproduce, and pass their genes on to the next generation. Individuals that are less well-adapted are less likely to reproduce and pass on their generations. Over a long period of time, the individuals that make up a population are better and better adapted to the environment in which they live. This fact of life has been summarized in one of the most famous expressions in all of biology, the "survival of the fittest." The phrase simply means that individuals that "fit" the needs, demands, and opportunities of the environment are most likely to have offspring that will also "fit in" with the environment. This process is described as natural selection. The term natural selection refers to the tendency of organisms that are better adapted to an environment to survive, reproduce, and pass on their genes to the next generation. The effects of natural selection can be seen when an environment changes. As an environment changes, the characteristics needed to survive within it also change. Evolution continues, but the direction it takes may alter. For example, suppose that global climate changes occur. Suppose that the annual average temperature in northern Canada begins to drop. Over a one-million year period, the region becomes much colder. In such a case, organisms that are better adapted to cold climates will survive, reproduce, and pass on their "cold weather" genes to their offspring. The individuals that make up a population will differ from the individuals in a population one million years earlier because the population has adapted to new environmental conditions. Natural conditions have "selected" those individuals (along with their genes) best adapted to the new environment. Mutation. An important factor in evolution is mutation. Mutation is the process by which changes occur in an organism's genes that are transmitted to the organism's offspring. Mutations are often regarded as undesirable events because they often lead to genetic disorders that result in the death of individuals. But mutations also can be positive events. For example, consider a group of disease-causing bacteria that are exposed to an antibiotic. The vast majority of those bacteria will be killed by the antibiotic. The use of antibiotics to cure certain diseases is an example of this fact. But suppose that a mutation has occurred in a small fraction of the bacteria—in even a single bacterium—treated with the antibiotic. And assume that that mutation provides the bacteria with an immunity (tolerance) to the antibiotic. In such a case, the vast majority of bacteria lacking the mutant gene will die off. The few bacteria that have the mutant gene will be able to survive, reproduce, and pass on their immunity to the antibiotic to their offspring. In fact, this kind of evolution takes place all the time in the real world. Any antibiotic that has ever been discovered or invented eventually loses its effectiveness in treating disease. The reason is that bacteria with mutant genes become resistant to the antibiotic, reproduce, and eventually become the dominant forms of the bacteria. The same kind of change occurs in every kind of organism. A mutant gene may provide a tree with the ability to grow taller, giving it an advantage over other trees lacking the mutant gene. A tiger may attain a mutant gene that makes it more aggressive, stronger, or able to out-hunt its brothers and sisters. A mutant gene in the human brain may provide a person with more intelligence, better perception, or some other trait that gives him or her a slight advantage over his or her peers. In each case, the mutant gene changes the course of evolution and gives one individual a survival advantage over other individuals in the same population.